Have you noticed that your face is losing volume and face is not as full as young anymore? You are not alone! Millions of people all over the world share your concerns, and we helped thousands of clients in Edmonton alone. So it is your turn to get your Younger Version of You. Fillers to compensate for aging and volume loss? Facial aging is associated with changes in our skin composition and facial features & Dermal fillers are used to reverse and correct age wrinkles and lines. Therefore, the extracellular matrix that is mainly composed of fibrous special proteins such as collagen and fibrine diminishes and lose it recoil and elasticity. Think about an old elastic that you stretch 1000 times over years, this is how skin losses its elasticity. Moreover, External factors also accelerate processes, such as smoking and UV exposure. Dermal filler injections and cosmetic injection of Botox helps in preventing and correcting facial features that come with aging such as fine and deep wrinkles. Hyaluronic acid (HA) is the main active ingredient in most of the fillers used today as Juvederm and Restylane. HA is a natural polymer product that is purified and crosslinked to produce the best alternative to our natural extracellular matrix fillers that we lose over years. Dermal fillers are proven to be safe and have a reversible effect. We can use a special enzyme injection to instantly dissolved in case of adverse reaction or client preference. What to Expect after Dermal Fillers? Different pharmaceutical companies have different brands, for example, Allergan has Juvederm and Galderma has Restylane. Both brands come in different thickness for different areas of the face. We inject Thicker, fillers such as Juvederm Voluma, in deeper skin planes to achieve use for facelift and cheek augmentation. Under eye circles and bags, have to be corrected using thin fillers such as Volbella to avoid the sausage effect and bluish light reflection. These infographics give a simple comparison between different fillers and indications. We discussed Lips fillers in detail in a special page for lip injection, please click here. Similar to Juvederm, it comes in different degree of crosslinking and water absorption. There is Restylane Volum, refyne and defyne. Why do we use Dermal Fillers? Dermal fillers, mainly hyaluronic acid fillers, are the perfect solution for facial aging associated with volume loss. The concept is very simple, we inject the fillers in the face cavity that used to be full. The fillers Absorb water and work similar to the lost fats. Dermal fillers can be injected under eyes, in the cheek, lips, jawlines, and nasolabial folds. We inject fillers also to help to remove some scars and deep lines and wrinkles. Dr. Kamal is an expert with derma fillers injection, He developed his own injection techniques to get the best results with the least amount of fillers. He is passionate about his work and perfectionist when it comes to results. Therefore, depending on the injection area, the filler type, and the medical staff preference, fillers can be injected using a sharp needle or blunt cannula. Dr. Kamal prefers sharp needle for lip injection and cannula for cheek augmentation and eye circle and eye bags correction. Expected Results of cheek fillers As you can see the before and after picture above, cheek fillers had an amazing difference on the face in whole, including under eyes and the nasolabial folds. We usually combine the nasolabial fold correction in the mid-face augmentation alongside the cheek fillers. Using a blunt cannula, Dr. Kamal injects the filler medially to support the nasolabial fold and remove the groove. Injecting filler in the cheek is known as cheek fillers, cheek augmentation or even mid-face augmentation. Laying filler over the Malar bone (cheekbone is ideal to create more anatomical distanced cheek protection for a younger look. As you can see the before and after picture above, cheek fillers had an amazing difference on the face in whole, including under eyes and the nasolabial folds. Most of our clients come to the free consultation with some mix-up and confusion between Botox and Fillers. These two infographics explain the difference between the indications, areas of injections and expected results between fillers and Botox of Botox and Fillers. something. We see clients on a regular basis that get comments from their family. We inject Botox precisely in a specific muscle, procerus and corrugator muscles in case of frowning. work as scaffolds to fill the empty spaces in the face that results due to losing facial fats and protein over time. Other than lips, we use HA fillers to restore the younger version of the face by performing mid facial augmentation or to correct static wrinkles and lines in combination with Botox. What are the side effects of Jawline contouring with filler injections? However, these Side effects lessen after some days. Do I need additional treatments? Most patients require a minor touch-up to get their desired aesthetic goal. However, it is advised to wait for two weeks before undergoing any revisions. 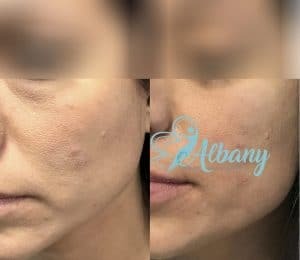 why choosing Albany cosmetic and laser center? Since we started the medical spa about 2 years ago, we grew to be one of the biggest filler clinics in Edmonton. Our database has over 7000 clients with 5 stars satisfaction rate. You have only one face, trusted with the expert. How many syringes do I need? You need about 2 to 4 syringes of Juvederm Voluma to define your Jawline. But it also depends on your aesthetic goals. Some patients will see results immediately after filler treatment. But, it takes about seven to two to three weeks to see complete improvements.